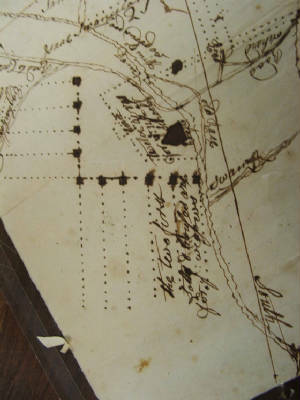 This map is from Special Collections of the Rutgers University Libraries, specifically Alexander Library on College Avenue at the Rutgers, New Brunswick campus. There are two houses on this map: one on the western stream is listed as Stephen Calvin & Joseph Micty. The house at the lower left was known to be the residence of John Brainerd. Note the layout of the ten cabins in an inverted L-shape. The site of this community is still in open space. A map will be added shortly that shows the approximate location of the Indian church and cemetery and other sites associated with the Brotherton Reservation. It is known that the Indian cemetery is now grown over. This map shows that lots were set aside for the Indians. However, based upon the documents, it is not clear that any of these lots were actively farmed or had houses placed upon them. To the contrary, the documents infer that these lots were not necessarily controlled by those persons named on this map, or their descendents. More research needs to be done to determine this question. The newly laid-out roads include one leading to the north, called the Road to Fosters, and another west-east road which is present-day Willow Grove Road, or County 648. 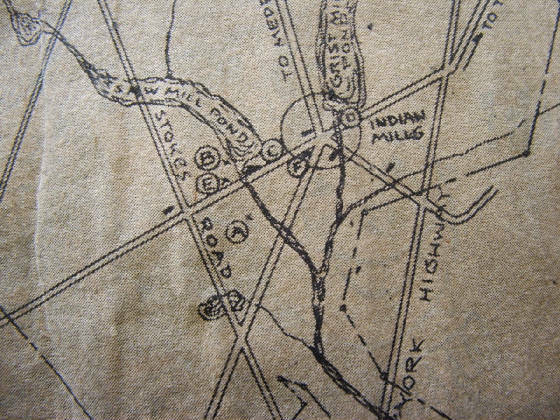 Map of Brotherton, drawn by Ken Brewer (copy in the Nathaniel R. Ewan scrapbooks at the Burlington County Library, dated 1/25/1957). The letters are as follows: A - Brainerd's House, B - Indian Burial Ground, C - Saw Mill, D - Original Saw Mill, E - Log Church, F - Corner Store. 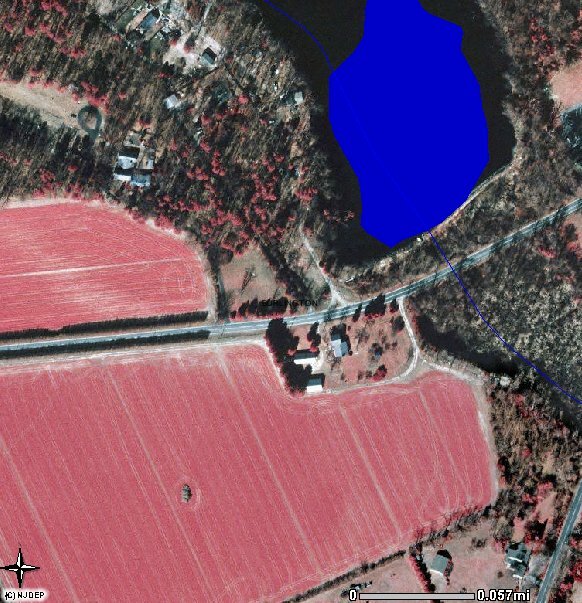 2002 NJ DEP aerial photo of Indian Mills, Shamong Twp., Burlington County . As Willow Grove Road traverses from east to west, it leaves Indian Mills and approaches open space to the west of the stream. It was in the wood line north of the road where the Indian church was located (and the cemetery is located). To the south of the road, in the large open field just west of the stream, Brainerd's house once stood. 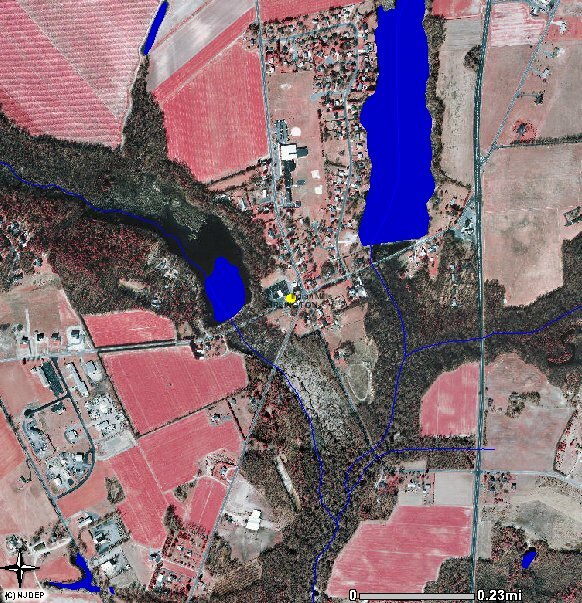 It appears that the location of the cabins, church, Brainerd's house and Calvin's house are still undeveloped. Area of the Indian church & cemetery, and Brainerd's house.